Please take a look through our “White Papers” section where we recently published a paper entitled “Biological Soil Management Puts The Soil To Work For You.” This paper is an overview of the work that we have been dedicated to for the past thirty years. This work has helped so many clients and friends cut their days a little shorter and take away some of the anxiety that the job can create. Please read it in good health and share it with someone who you think may find it of value to their career. I was recently going through old articles and papers that we published back when we started EarthWorks, in the late eighties, and found the terms Biological Soil Management and Carbon Based Fertility in our earliest writings. Consistency and philosophy is a good thing! Biological Soil Management is a philosophy. It has taken on great momentum recently as more and more turf and ornamental managers discover the value of feeding carbon to the microbial populations of the soil and understanding that when the soil is managed “first” the highs and lows of fertility levels out. 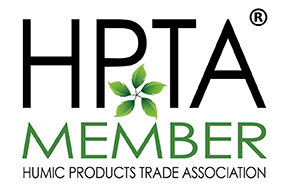 The number of new “organic” products that are hitting the market is extensive and most turf sales people are talking about something carbon based, which in many ways is a good thing but can also be confusing. I spent a wonderful day recently with an old friend, Glenn Smickley, former Golf Course superintendent at Robert Trent Jones Golf Club and current General Manager at the Cal Club, playing golf at one of my favorite properties, Fiddlers Elbow Country Club in Bedminster New Jersey. Fiddlers Elbow was the first place that we learned about the benefits of Biological Soil Management and Glenn was one of the earliest adapters at RTJ, that combination made for great conversation as I watched Glenn play golf and wondered if I would run out of golf balls! The first EarthWorks dry fertilizer was our 5-4-5 and the first golf course where it was applied was Fiddlers Elbow Country Club back in the early 1990.s under the direction of then golf course superintendent Tom Breiner. As the story goes… Tom applied the 5-4-5 on one fairway to see what it could do for him. It was a very hot and humid week in mid July and rain had been scarce. My career was very young and honestly, I lacked the experience and confidence to know exactly what the 5-4-5 would do, I was relying on the expertise of my business partner Jerry Brunetti. Tom called me and rather abruptly said “you have to come out here and see this” and he hung up! It was a twenty minute drive from our office to the course and the whole trip I was imagining my life’s investment up in smoke. When I got there, he drove me out to the fairway where he made the application. Not sure what I was looking for, he pointed out that this stretch of fairway where he applied the 5-4-5 was the only turf on the property that was standing tall and green, everywhere else was purple and wilting. Perhaps that was the first day of my journey on the road to understanding Biological Soil Management. I shared that experience with Glenn as we drove around talking about how he discovered the benefits of managing the soil first. He built Robert Trent Jones Golf Club in the early 90’s on tight calcium deficient soils in the heart of the Mid Atlantic, arguably the toughest place to grow grass in the country, and against all advise he put in bent grass wall to wall. It wasn’t easy, the summers were hot, humid and long and there was Take All Patch and other problems. His instincts told him that the soil had to be the focus and he starting balancing the soil chemically, getting calcium and magnesium levels in line and then he starting feeding the soils with 5-4-5 and other carbon based fertilizers. He was aggressive in the beginning knowing that he had to build a strong base but was able to cut back after a couple of years and he discovered that his fertility highs and lows were no longer an issue. It’s been almost 30 years since I first met Glenn, he has taught me a lot and helped my career and maybe I helped him discover a few things about how a soil really works as well. 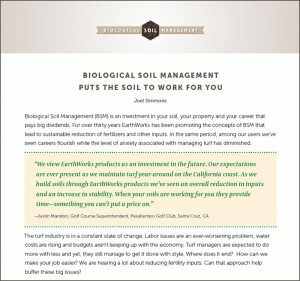 Biological Soil Management is an approach that can help any turf manager in any market, it will allow you to sustainably reduce inputs, reduce water needs and maybe even make the need for chasing hot spots less, saving your labor budget a little. Our new White Paper can help make more sense of this philosophy of Biological Soil Management. Please let us know what you think and keep an eye open for more white papers! I thank everyone for the years of support.